Welcome to Nuke-Con’s 28th Annual Convention! Nuke-Con is Omaha’s premier weekend-long game convention. We are a not-for-profit corporation run by volunteers that strives to promote the positive, educational, social, and entertainment aspects in all types of gaming hobbies. We offer all kinds of tabletop games ranging from oldies-but-goodies like Yahtzee to the latest-and-greatest board, mini, card, and live-action events. Our convention content is driven by the people who have games they want to share with other gamers. 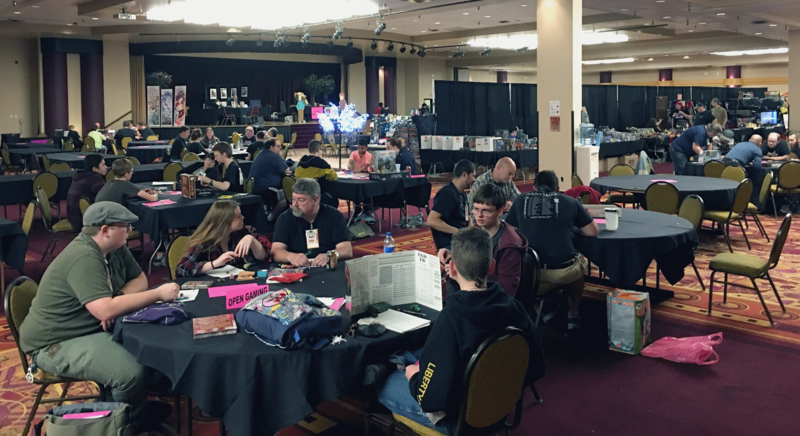 In addition to the main convention, Nuke-Con holds three to four Aftershock game days throughout the year to give people a chance to get together and play games. Games offer reading, listening, and physical learning opportunities featuring counting, strategy, teamwork, and sportsmanship. Gathering together offers the opportunity to further a cooperative spirit of learning. Nuke-Con is proud to be able to host more games and grow the gaming community. Escape Reality: Play a Game! Ready to get in on the action? Purchase your convention badge for Nuke-Con 2019 via the Registration Page. Want to run a game? You can submit your event before September 5th, 2018 online via the Fallout Shelter. Click Here to Purchase Convention Badge! Click Here to Register Events!